A report from the Bangladesh government to the Union home ministry over the recent spike in infiltration of terrorists from the neighbouring country has rung alarm bells in the security establishment. Forwarded to the Bengal home department, the report says in 2016, there has been a more-than-threefold increase in intrusion of Harkat-ul-Jihadi Al-Islami (HuJI) and Jamaat-ul-Mujahideen Bangladesh (JMB) extremists into West Bengal, Assam and Tripura compared to that in 2015. 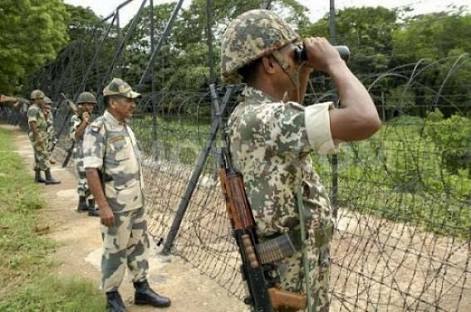 The Bengal government and BSF have been told to increase vigil not only on the Bangladesh border, but also along areas bordering Assam. The development assumes significance with NIA finding overseas terror links and the direct role of JMB in Bengal in the Khagragarh blasts that rocked Burdwan on October 2, 2014, killing 2 persons. Though the report didn't specify exact numbers, it said approximately 2,010 HuJI and JMB operatives — including linkmen — have infiltrated into the three Bangladesh-bordering states. While nearly 720 men made a safe passage through the Bengal border, the remaining 1,290 are suspected to have entered through Assam and Tripura. Bengal government officials are sceptical about the report. But even if the number is close, it is huge since intelligence reports pegged infiltration figures at 800 and 659 for the years 2014 and 2015, respectively. "We are not sure about this spike in infiltration because after the Khagragarh blast in 2014, vigil has been increased and our top officials are constantly in touch with BSF. We are trying to gather information to confirm the veracity of the report," a senior home department official said. However, Assam Police is concerned about the development. "There is certainly an increase in terrorist activity because over the last six months, we have arrested 54 JMB operatives, including some linkmen, and this justifies everything," additional director general of police (SB), Assam, Pallab Bhattcharyya, said. "We have formed a high-powered committee of top police officers and MLAs to check infiltration. They visit the border regularly and conduct meetings with security forces," he added. There is information that Jamaat-ul-Mujahideen Bangladesh (JMB) secretary Iftadur Rehman entered India on January 12 this year on a fake passport and has established contact with linkmen in Assam and Bengal. He may also visit Delhi, intelligence sources said. Iftadur, whose real name is Sajjad Hussain, is a native of Moulvibazar in northeast Bangladesh. "Apart from that we also have information that on January 18, a meeting between linkmen from Assam, West Bengal and New Delhi and the top JMB and HuJI leadership took place in Mymensingh district of Bangladesh," a source said. According to police, there has been a subtle change in the logistics and operational mechanism of these neo-militants post-Khagragarh and this was creating problems in tracking them. "Previously, there were certain porous districts like Malda, Murshidabad or Nadia through which they used to come. The state intelligence department had even identified 14 such paths that were mainly used for entering the country. Now, they are coming through Assam and Tripura and then entering Bengal," a police officer said. "Earlier, they preferred to come to Malda through Chapai Nababgunj, but now their destination is Sylhet, from where they cross the Barak Valley and the river and enter either Meghalaya or Assam. Once they enter India, they manage to get an Aadhaar or voter ID card and then sneak into Bengal. There is another route where they come to districts like Brahmanberia, Mymensingh or Chattagram and then take the riverine route to Tripura," the officer said.